It was late afternoon when left Bar Harbor worn out from lobstering, but we are nothing if not determined, so we hopped in the car and pointed it toward Vermont. 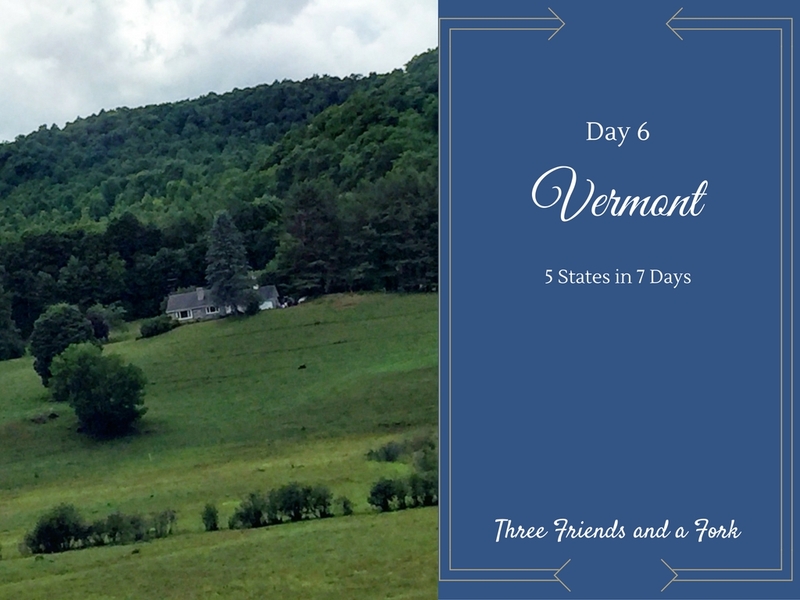 We had no idea how far we would get, but since our goal for day six was to visit Ben and Jerry's, we wanted get as close Waterbury, VT, as we could before we stopped for the night. We surprised even ourselves, because by the time we pulled into the brand new Fairfield Inn and Suites in Stowe, VT, it was 2:00 in the morning and we were punch drunk from laughing and driving for 8 hours! FYI, do not let the moose crossing signs in Vermont, New Hampshire and Maine confuse you. We spent 8 hours looking for just one scrawny moose with no luck. We did have luck of another sort, though. Because we were checking in so late, we received a half-price rate at the motel! Our room was large, clean and as I mentioned, brand-new! We were so happy when we finally fell into our beds, completely exhausted, with visions of ice cream dancing in our heads. But Day 6 was not to be squandered, so we were back up and ready to go again by 9:00 the next morning. We had a date with Ben and Jerry! We piled in the car and drove about 15 minutes to Waterbury wondering which ice cream flavor we would choose. As we pulled into the parking lot and began to stroll toward the factory, the first thing we noticed was the cemetery where all the dead flavors are buried. With names like Aloha Macadamia and Fresh Georgia Peach, we were sad that some of them had met such an untimely death. The rhyming epitaphs on each tombstone were clever and I couldn't help but think that writing the monument poems would be a fun job! For instance, this rhyme for the late great Tennessee Mud reads: The bottle is empty, the cup and the glass. Mud with Jack Daniels was not meant to last. Tennessee Mud went back to the dirt after only one year, in 1989. As we got closer to the building, we saw giant silos housing the ingredients for making ice cream. We enjoyed our tour of the facility and even got to sample the flavor of the day, which was cookies and cream. After the tour, we wandered around outside, enjoying the pretty day, before finally ordering ice cream cones of our own choosing. Dede couldn't resist the punnily named Tonight Dough which was made up of chocolate and caramel ice cream with chunks of chocolate chip cookie dough and peanut butter cookie dough. Dede loved it, but my friends know I do not like cookie dough unless the dough is fully baked into a cookie, so I passed on the Tonight Dough. Instead, I settled on Maple Walnut and it was really good. I would definitely get it again, but it can only be gotten at the Ben and Jerry's factory, as it is not packaged for your local grocery. If you feel very industrious, Ben and Jerry have published the recipe for their delicious Maple Walnut ice cream. Here is the recipe. If you happen to make it, please give me a call! Whisk the eggs until light and fluffy. Gradually whisk in the sugar until well blended. Add milk and cream. Gradually add maple syrup and blend well. Add walnuts just before the ice cream is fully frozen. Makes about a quart or what I like to call...one serving. Just kidding! I cannot remember which flavors Carter chose. I say flavors because I am pretty sure he made more than one trip to the window to order ice cream. I do think he ordered some more of the Cookies and Cream we sampled on the factory tour. We left Ben and Jerry's full and ready to see what other fun adventures Vermont had in store for us. The scenery was beautiful, lots of rolling fields, green mountains, bucolic farmland and quaint towns. We eventually found ourselves in the lovely little town of Woodstock, Vermont. It was a beautiful village full of cute shops and restaurants. We could not resist walking around the rustic downtown streets, even though gray clouds had gathered and were hanging low in the sky. Sure enough, as soon as we parked and got out of our car, the rain started coming down. It didn't discourage us, though. We thought about eating in this yummy sounding restaurant, The Village Butcher, but we kept walking. Definitely a place you might want to consider if you visit Woodstock. We enjoyed this little gift shop named, Clover. The downtown streets are wide and encourage visitors to park and visit. As customers of this store paid for their purchases, the store owner's cat collected behind the ear scratches. We decided it was time for lunch and, after canvassing the downtown merchants, we chose to eat at the Woodstock Farmer's Market. It was a short drive from downtown, but it was a very good choice. Woodstock Farmer's Market is my favorite kind of place and oh, how I wish we had one of these in Scottsboro. It is part farmer's market, part restaurant, part bakery, part deli, part grocery, part nursery, and all amazing! We stared at the sandwich menu, wondering how we were ever going to choose. The baked goods were all so tempting! I would shop at the cheese counter every week, if we had one of these close by. All kinds of wines were available and the grocery was full of interesting choices. And did we mention this was a farmer's market? Just look at all the fresh produce! Need plants for your yard or garden? Woodstock Farmer's Market can fix you right up! So, what did we eat? We got grilled cheese sandwiches! But not just any grilled cheese sandwiches. These had smoked Vermont cheddar, provolone and parrano cheeses, along with tomato and Honeycup mustard grilled on roasted garlic parmesan bread. Dede said it was the best grilled cheese sandwich she ever had and, in fact, it was her favorite meal of the entire week. We also had chips and an ice-cold Bruce Cost ginger ale made with real ginger. The rain had stopped, so we enjoyed our food outside on a picnic table. Carter, of course, could not resist a cupcake. I can't remember what it was, but it looked really good! I left with a bag of the best coconut caramels I have ever eaten. Made in New Hampshire, they were a little taste of New England to enjoy as we left beautiful Vermont. We finished up day six by driving back to our home away from home in Jamestown, RI. We had to drive back through New Hampshire and we still had not taken one single photo in that state. We had thought we would get a picture of the New Hampshire coastline when we were driving to Maine, but we didn't see one photographic spot on that drive. Then, we traveled through the White Mountains of NH when we were headed to Vermont, but that was in the middle of the night. This time we were determined to get at least one photo in NH, but what? We ended up getting off the interstate in Manchester and almost despaired of finding anything we wanted to photograph. The one thing that seemed to dominate the skyline, was a Catholic church and we decided that would have to work, so here it is! Ste. Marie is a gothic revival style church on the west side of the city. The church was founded in 1880, with the current building constructed in 1891. We did find one more object to photograph, which we found amusing. I'm pretty sure, if this sign was found in the south, it would be worded in a different way. It reminded me of the yield signs in Canada, which say Squeeze Left or Squeeze Right instead of Yield. Anyway, all you dogs are put on notice. No dog fouling in Manchester. We said good-bye to Vermont and New Hampshire and spent our last night in beautiful little Rhode Island. Day 7 saw us eating breakfast in our favorite Jamestown joint, Slice of Heaven, making a quick stop in Newport to check out the jewelry at Alex and Ani's and, then, driving back to Boston to catch our flight. It was a wonderful trip! Ben and Jerry's and Woodstock Farmer's Market.